Neil’s post from last year — “Why Does Jesus Never Do Anything Wrong?” — got me thinking about a story told by David Livermore in his course, Customs of the World: Using Cultural Intelligence to Adapt, Wherever You Are. 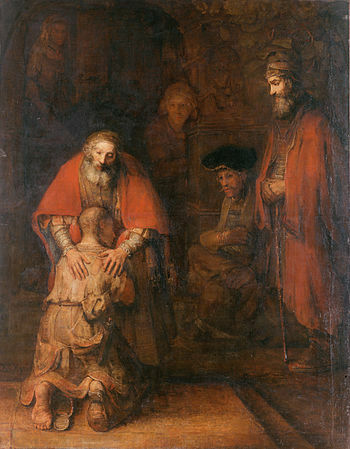 He tells of a New Testament scholar and minister who performed a small experiment in which he asked people of different cultures to tell him the parable of the Prodigal Son. Afterward, he compared the points of story to what people remembered, noting what they tended to remember as well as what they left out. His results were somewhat surprising. It turns out that our cultural background, social context, and personal history can have a large impact on what we consider important. Without realizing it, our frame of reference profoundly distorts how we understand and recall information. How did the Prodigal Son end up in a pigpen? Although Livermore and others have used this anecdote (you can find many references on the web), I found it rather difficult to track down the original scholarship. Sadly, the book in which the paper first appeared, Literary Encounters with the Reign of God, is far too expensive for me; however, you can see bits of it in the Google Books preview. Fortunately, the author, Mark Allen Powell, recapitulates much of his paper in the book, What Do They Hear? Bridging the Gap Between Pulpit and Pew. I would add that the situation might even be worse for those of us who were steeped in a particular tradition since childhood. Not only have I been hearing New Testament stories for over five decades, but I’ve been told what they mean, again and again. I even know them by titles that drive the reader or hearer to understand them from an orthodox point of view. For example, I knew the parable of the Prodigal Son long before I knew what the word “prodigal” even meant.